These scones remind me of the cinnamon-sugar cookies that my great grandmother would roll out and bake from scraps of pie dough. Freshly baked, the crispy edges of these scones are a nice contrast to the moist interior. 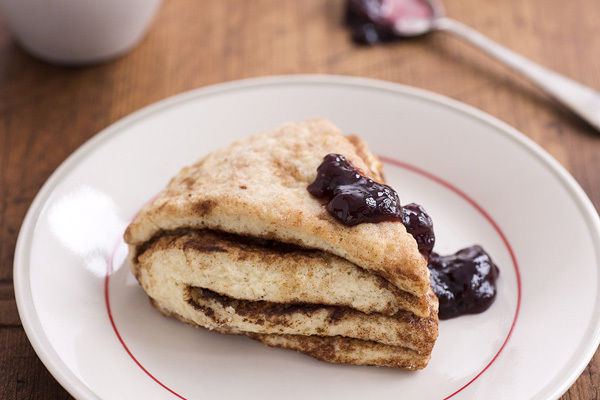 The layers in these scones separate beautifully while baking, revealing the deep dark cinnamon sugar flavor inside. Use a heavy-duty pastry blender to cut the butter into the flour mixture. Place an oven rack in the middle position. Preheat the oven to 375°F (190°C). Line a sheet pan with parchment paper. To make the batter: In a large bowl, combine the flour, sugar, baking powder and salt. Cut the butter into the dry mixture until it resembles coarse cornmeal, but is not clumping up. Stir in the half-and-half and egg until combined. To make the filling: Roll out the dough on a lightly floured surface to a 10 x 6-inch rectangle. Sprinkle 1 tablespoon sugar and 1 teaspoon cinnamon over half of the rectangle, then fold it in half. Roll the dough out again into an 8-inch x 6-inch rectangle. Sprinkle the remaining tablespoon of sugar and teaspoon of cinnamon over half of the rectangle, then fold in half. Pat the dough into a 6-inch circle and cut into 6 wedges. Evenly space the wedges on the pan, sprinkle with sugar and bake until golden and just firm, 15 to 17 minutes. Let the scones cool on the pan for 5 minutes, then transfer to a wire rack to cool. Serve warm or at room temperature.